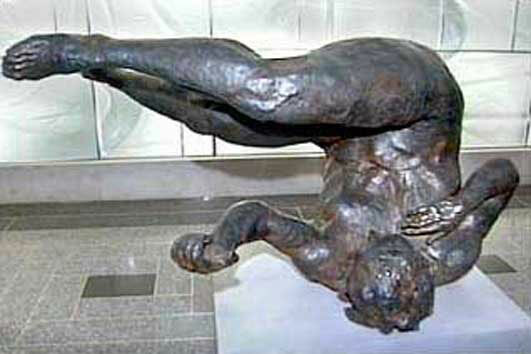 Fischl's bronze, a statue of a falling woman, was designed as a memorial to those who jumped or fell to their death from the World Trade Center. It was abruptly draped in cloth and curtained off on September 18th, 2002 because of complaints that it was too disturbing. A spokeswoman for Rockefeller Center apologized if anyone was upset or offended by the display of the sculpture, claiming that was certainly not their intent. Despite the obvious graphicness of the piece, opinions were evenly split on whether it should be displayed or not. Officials at Rockefeller Center had the work removed.